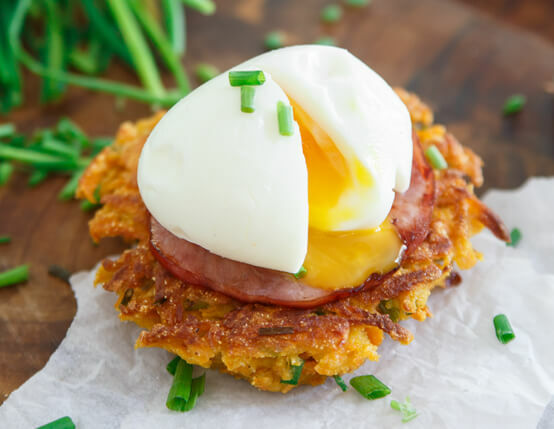 Sweet potato fritters are topped with savory Jones Canadian Bacon and a soft boiled egg in this deceptively easy, flavorful breakfast recipe. Combine sweet potato, chives, cornmeal, eggs, milk, salt and pepper in large bowl. Mix together with fork until fully incorporated. Heat enough oil in bottom of large skillet over medium-high heat so that there is a thin coating to pan fry the sweet potato fritters. Divide sweet potato batter into 6 portions. Roll into ball then flatten and place in hot oil. Pan fry each fritter for about 4 minutes per side, or until golden brown and sticking together. Flip and cook for 4 minutes. Remove to paper towel lined cooling rack and set aside. Cook in batches until all sweet potato mixture is gone, adding oil to pan as needed. 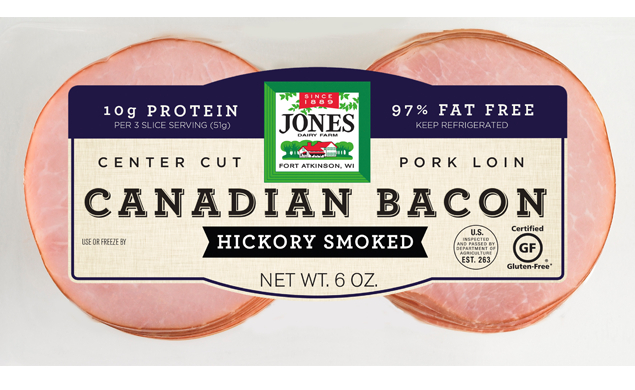 Fry slices of Canadian Bacon in leftover oil for 1-2 minutes per side, until browned. Place a piece of cooked Canadian Bacon on top of each fritter. Top with soft boiled egg, garnish with additional chives and serve immediately.